Providing you the best range of autofy brass accessories and autofy bike riding gear accessories (hand and wrist protector) with effective & timely delivery. Nothing equals a badge branding when it comes to giving a signature effect to your vehicle and if this customization is available in brass, what else would you ask for? Autofy Brass Accessory is exactly what you need on your bike for it to reflect your style and individuality. Perfect ratio between Copper and Zinc is what it takes to develop the Brass used to make Autofy badges as the properties of Pure Brass are required for the material used to qualify in the making of the final product. Though Pure Brass is corrosion free with characteristic shine, a Lacquer coating has been done on the product surface to ensure added luster and cleaner finishing. These properties only make the product longer life both in terms of usability and style. On the top of that, the product does not lose its shape even if subjected to summer’s heat or minor collateral impacts. A peculiar care has been taken in ensuring the detailed representation of concept of the design. A bolt has been embedded into the main body of the badge to ensure the badge does not come lose its grip on the vehicle surface as it usually happens in case of adhesive based badges. 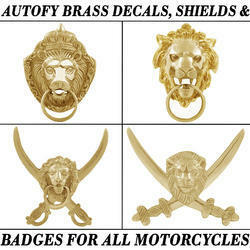 Due to these characteristics, you can always feel free to customize your bikes with the Autofy Brass Badges without worrying about where you live and what conditions your bike faces. This is a highly used product by bike enthusiasts, biker lovers and biker boys who love their bikes Royal Enfield Bullet Standard 350, Royal Enfield Bullet Standard 500, Royal Enfield Bullet Classic 350, Royal Enfield Bullet Classic 500, Royal Enfield Bullet Classic Desert Storm, Royal Enfield Bullet Electra, Royal Enfield Bullet Thunderbird 350, Royal Enfield Bullet Thunderbird 500, Avenger, Pulsar, Duke KTM, Harley Davidson, Yamaha FZ, R15, CBR, Ninja, Apache, Hayabusa and other bikes. 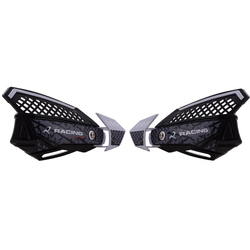 Autofy racing hand protector wind deflector and lever protector is a multi-purpose product which has a universal fitting and can be installed on all the bikes. These are your best mates when you plan any bike drive to Highways, Mountains, City Long rides etc. The material used is high density plastic which can withstand heavy impacts protecting your hand, lever etc. This protector also saves you from chill winter waves directly coming onto your hands and extreme hot winds also. The installation is also very easy and is a 1 nut process. The design is made light and easy to install. This is a highly used product by bike enthusiasts, biker lovers and biker boys who go love on their bikes Royal Enfield Bullet Standard 350, Royal Enfield Bullet Standard 500, Royal Enfield Bullet Classic 350, Royal Enfield Bullet Classic 500, Royal Enfield Bullet Classic Desert Storm, Royal Enfield Bullet Electra, Royal Enfield Bullet Thunderbird 350, Royal Enfield Bullet Thunderbird 500, Avenger, Pulsar, Duke KTM, Harley Davidson, Yamaha FZ, R15, CBR, Ninja, Apache, Hayabusa and other bikes.